Proteins are present in all living organisms. The unique functions they perform in biochemical processes are dependent on their three-dimensional structure. Dr Wieland Steinchen and Professor Gert Bange, from the Center for Synthetic Microbiology (SYNMIKRO) and the Faculty of Chemistry at the Philipps University of Marburg, aim to understand the structures and functions of several different proteins. They use a special analytical technique, known as ‘Hydrogen-Deuterium Exchange Mass Spectrometry’, or HDX-MS, to carry out their investigations. Proteins are compounds comprising a chain of amino acids. 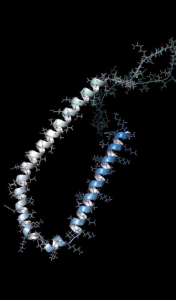 This chain is folded up into a three-dimensional shape that gives each protein its unique set of properties. Understanding the structure, reactivity and function of proteins, and other large molecules, is vital in understanding how they will interact with other chemicals in different conditions. Many analytical techniques have been developed to ascertain this information. As a result, there are several, steadily growing libraries that provide structural and chemical information on proteins and the subunits that make them up. However, there is always room for further contributions to this field of study. Proteins function as catalysts, transport and store useful compounds in the body, provide mechanical support to cells and tissues, help in fighting disease, generate movement, transport signals around the body, and control growth. 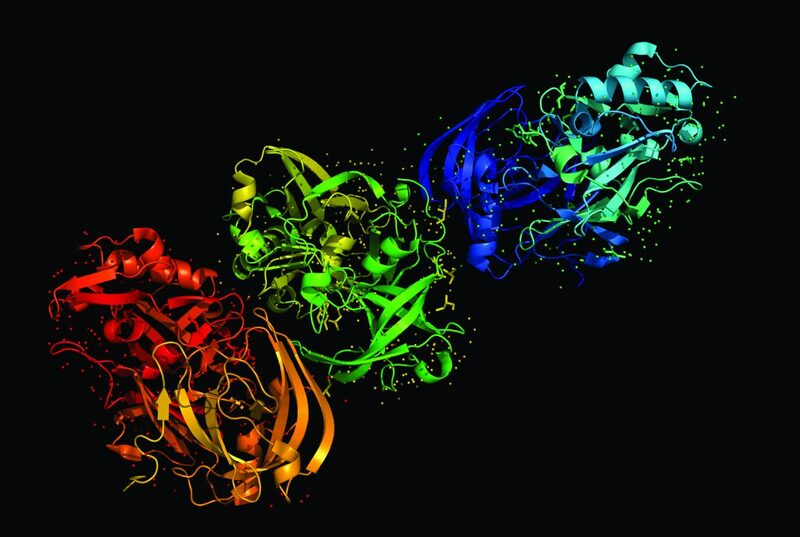 Therefore, detailed information on protein chemistry is useful in many applications and can aid in improving, or in some cases, inhibiting their action in living organisms, including humans. To that end, enhanced analytical techniques and equipment are being developed. In recent years, a technique known as ‘Hydrogen-Deuterium Exchange Mass Spectrometry’, or HDX-MS, has offered an attractive, new route for analysing the behaviour and structural features of proteins. In a nutshell, the technique monitors the exchange of hydrogen atoms from the protein with deuterium atoms in an appropriate solvent (deuterium is a version of hydrogen which, in addition to a single proton, has a neutron in its atomic nucleus). The degree to which this exchange occurs at various points along the protein is dependent on its physical structure and folding patterns. This is the parameter that is measured in HDX-MS, and this information can complement other high-resolution structural approaches. In fact, the latter well summarises Dr Steinchen and Professor Bange’s research work. They have been using the HDX-MS methodology to characterise the structure and function of numerous proteins, especially that involved in metabolism of second messengers or their target proteins. The ability of living organisms to adapt to nutrient deficiencies, environmental change or external stress is critical to their survival. Biochemicals known as ‘second messengers’ play a vital role in this regard. Under certain circumstances, they transmit signals from a receptor on the surface of a cell, to proteins that can initiate cellular processes to counteract or remedy the change in conditions. In bacteria and plants, for example, a set of second messengers known as ‘alarmones’ are integral to cellular adaptability. Alarmones are biochemicals that are produced in greater quantities in response to stress. For example, when bacteria are starved of energy, the alarmones ‘guanosine tetraphosphate’ and ‘guanosine pentaphosphate’, collectively referred to as ‘(p)ppGpp’, modify cellular processes to help the bacteria conserve energy and survive. This is a big problem in cases where bacteria have caused infection. Cellular survival strategies make the bacteria harder to kill and infection harder to treat. It can also make disease control (in hospitals, for example) incredibly difficult. (p)ppGpp was the subject of Professor Bange and Dr Steinchen’s collaboration in 2015. Their goal was to understand the structural details of this alarmone combination and how exactly it is synthesised. Specifically, they examined the nature of a large molecule known as ‘Small Alarmone Synthetase 1’, or SAS 1, which has a central role to play in the synthesis of (p)ppGpp. As mentioned earlier, understanding the structure of large molecules is crucial to understanding its function. Dr Steinchen and Professor Bange presented a thorough molecular description of the synthesis reaction’s catalytic mechanism. This understanding, in cases of infection, would be extremely useful in discouraging (p)ppGpp production and limiting bacterial growth. This work also laid the foundation for the team’s subsequent research into the nature of other second messenger proteins – they wanted to gain further insight into their structure, and its relationship to function, using the HDX-MS methodology. In a collaboration of 2017, Professor Bange and Dr Steinchen investigated the role of second messenger proteins in the formation of so-called ‘biofilms’. Biofilms are aggregations of microorganisms, such as bacteria, which form as a defence mechanism. They do this in response to a significant environmental change. Biofilms cover surfaces and act as a protective layer. 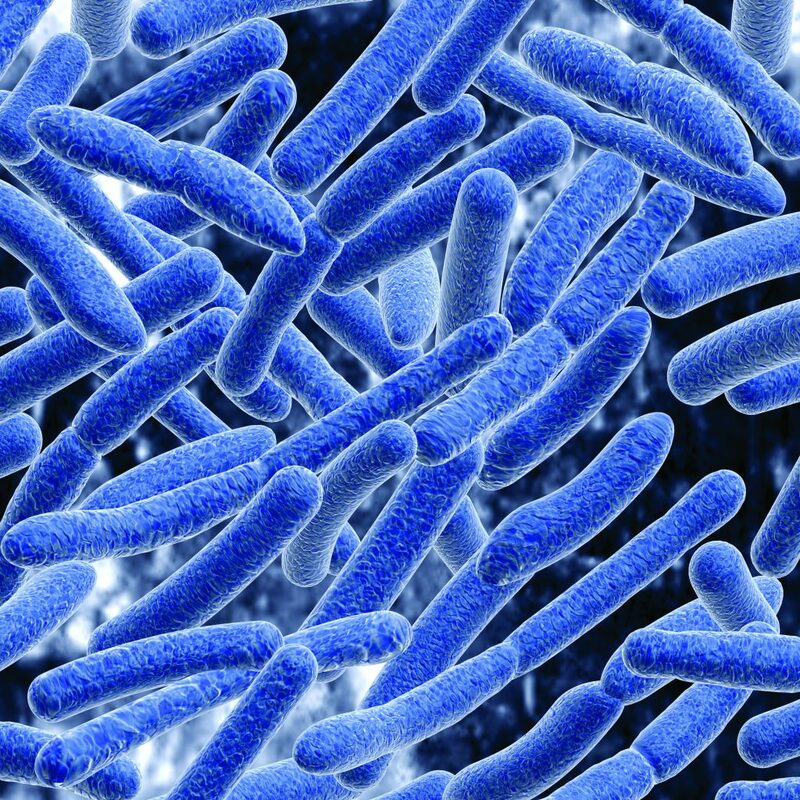 Biofilms can be both beneficial and detrimental to living organisms. Focusing on the negative effects of biofilms, they are a large contributor to disease and antibiotic resistance in humans. Crucial to bacterial biofilm formation is the production of chemicals known as ‘extracellular polysaccharides’. And crucial to the formation of extracellular polysaccharides is a second messenger protein known as ‘cyclic dimeric GMP’, or ‘c-di-GMP’. So, an understanding of the processes behind c-di-GMP formation would help in understanding biofilm formation and how this can be discouraged in the case of treating disease. In their research of 2017, Professor Bange, Dr Steinchen and their colleague Professor Becker from SYNMIKRO identified a class of c-di-GMP-responsive transcription factors (proteins that help turn specific genes ‘on’ or ‘off’), which had clearly acquired the ability to sense the signalling molecule c-di-GMP. Ultimately, this results in the formation of a biofilm. Interestingly, the binding of c-di-GMP to this class of c-di-GMP-responsive transcription factors was highly reminiscent of another process the team had observed before. By drawing this comparison, they were able to gain insight into the binding of c-di-GMP to its target, thus bridging the knowledge gap between the structure and function of this particular second messenger protein. In a recent research paper published in 2018, Dr Steinchen, Professor Bange and colleagues noted that scientists have extensive knowledge about proteins in their mature, folded states. However, it is generally unknown whether partially synthesised and folded proteins can execute biological functions too. In response to this challenge, Professor Bange and Dr Steinchen together with Professor Bibi from the Weizmann Institute (Israel) decided to take a closer look at premature folding states. They focused their research on a certain signal receptor protein found in E. coli bacteria known as ‘FtsY’ – a protein that plays a vital role in the production of other proteins found in cell membranes. As highlighted in the associated study, their goal was to investigate the underlying structural mechanism of how FtsY binds to signalling molecules that, in turn, trigger the production of other proteins. In short, the team found that structural intermediates, which differ greatly from the mature FtsY structure, can facilitate the binding of signalling molecules. In terms of wider implications, the research highlighted how certain intermediates, even though they may be temporary in nature, can dictate biological function. And it may explain, in part, why bacteria are so adaptable and resilient under changing conditions where normal processes are affected in some way. Throughout many of Dr Steinchen and Professor Bange’s research projects, HDX-MS has proved itself to be a most valuable tool. Indeed, even at the technique’s current stage of development, it has immense potential. One reference work commented, ‘while once a challenging and therefore sparingly used method, modern HDX-MS is more straightforward, rapid, and routine than in the past. As a result, the breadth of applications of the method has expanded.’ And, of course, there will never be a shortage of proteins to study using the HDX-MS technique. Considering the foregoing, and after having honed his skills in relation to the use of HDX-MS, Professor Bange, with the support of his colleague Dr Uwe Linne, developed significant HDX-MS analytical capabilities at the Philipps University of Marburg. In time, a professional, operational unit providing scientific and technical support for HDX-MS-based analytics was created, known as the ‘Marburg Core Facility for Interactions, Dynamics and Biomolecular Assembly Structure’, which was financially supported by the Deutsche Forschungsgemeinschaft (DFG). Dr Steinchen works as a scientist at that same facility. Using the resources and expertise at their disposal, Dr Steinchen and Professor Bange continue to develop novel approaches to understanding protein structure and function using the HDX-MS methodology. Their current focus is on understanding how proteins contribute to cellular adaptability and resilience. As described above, this knowledge may be used in the prevention and treatment of disease. But the team also seeks to understand the broader implications of cellular adaptability and resilience: ‘We want to understand how microorganisms – which provide the greatest diversity within the biosphere – conquer every possible niche ranging from hot springs to the human gut due to their fast adaptability.’ Again, understanding protein structure and dynamics is crucial to understanding the strategies that cells use to adapt to changing circumstances. In this quest, HDX-MS has been, and will be, a most invaluable analytical tool. After studying pharmaceutical science at Friedrich Schiller University in Jena, Germany, Dr Wieland Steinchen undertook his doctoral studies at the Philipps University of Marburg, under the supervision of Dr Gert Bange. He received his PhD in 2017 with the doctoral thesis entitled ‘Structural and Mechanistic Analysis of (p)ppGpp Synthetases’. He is now based at the university’s Faculty of Chemistry and LOEWE Center for Synthetic Microbiology (SYNMIKRO), and works as staff scientist at the associated HDX-MS research facility. 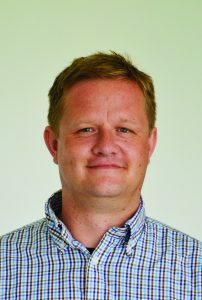 Dr Gert Bange received his PhD in biochemistry from the University of Heidelberg, Germany in 2007. 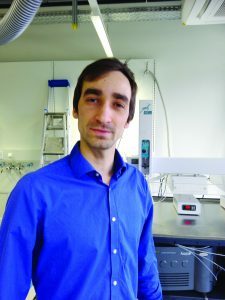 After postdoctoral research at that same university, he took up a position at the Philipps University of Marburg as Independent Research Group Leader of the LOEWE Center for Synthetic Microbiology (SYNMIKRO). In 2015, Dr Bange and his colleague Dr Linne started a designated facility for HDX-MS-based analytical science at Philipps University. Dr Bange currently serves as full professor of Systems- Biochemistry at that same institution and runs a research group known as the ‘Bange Lab’. 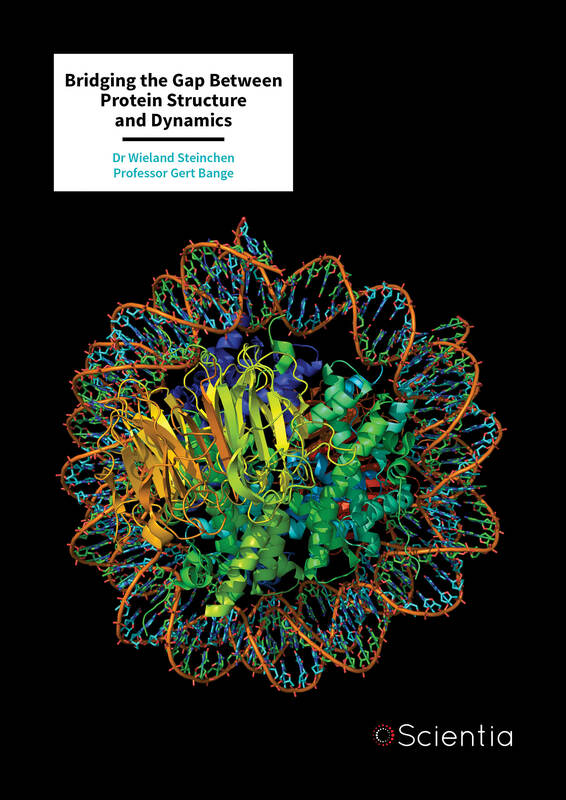 He heads the core facility for interactions, dynamics and biomolecular assembly structure of the Deutsche Forschungsgemeinschaft (DFG). A Karniel, D Mrusek, W Steinchen, O Dym, G Bange, E Bibi, Co-translational Folding Intermediate Dictates Membrane Targeting of the Signal Recognition Particle Receptor, Journal of Molecular Biology, 2018, 430, 1607–1620. S Schäper, W Steinchen, E Krol, F Altegoer, D Skotnicka, L Søgaard-Andersen, G Bange, A Becker, AraC-like Transcriptional Activator CuxR Binds c-di-GMP by a PilZ-like Mechanism to Regulate Extracellular Polysaccharide Production, PNAS, 2017, 114, 201702435. W Steinchen, JS Schuhmacher, F Altegoer, C D Fage, V Srinivasan, U Linne, MA Marahiel, G Bange, Catalytic Mechanism and Allosteric Regulation of an Oligomeric (p)ppGpp Synthetase by an Alarmone, PNAS, 2015, 112, 43.